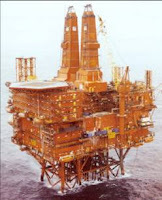 North West Hutton was discovered in 1975 by Amoco, 130 km north east of Shetland in 143 m of water. It was indisputably a huge find, set to rival its neighbour, the mighty Brent: but its geology was complex: “a series of tilted fault blocks and extreme lateral and vertical heterogeneity”, i.e a large number of small, hard-to-access segments or, in the words of the senior Amoco geologist, “a tub of guts”. But engineers love building things: so the owners went ahead and built a huge 39,000 tonne platform, which went into production in 1983. However, even after 55 wells were drilled, the worst fears were realised and the field would not yield its oil. Production should have been 130,000 barrels per day: it peaked momentarily at 86,000 and fell back to 20,000 – a technical and economic disaster, made worse by the oil price collapse of 1986. A disaster of another kind happened at Piper Alpha in 1988, and the Cullen Enquiry recommended that expensive safety modifications be made to offshore installations. By its tenth birthday, the financial status of North West Hutton was distinctly sub-economic - a candidate for early decommissioning. But abandoning North Sea platforms comes at a huge capital cost: so every day’s delay in recognising the inevitable is money in the bank. And every small thing that can be done to eke out its life is an effort well spent. Amoco set to with a will. An new Offshore Installation Manager (OIM) was appointed; a feisty Welshman, the kind of engineer who sees things in black and white. If a widget is strictly needed, it stays: if it isn’t, it goes. He started stripping things off the platform on a very large scale – and as with so many engineering projects, there was plenty of gold-plating to sacrifice. And with every widget that goes overboard, another widget – whose only purpose was to monitor the first one, goes too. Soon, he’d stripped the platform down to the bare essentials – and that was pretty damned bare – slashing operating costs and buying several years of delay. Ten years on, with BP now in charge and oil prices even lower, the inevitable seemed at last to be nigh: so a complex decommissioning scheme was devised (no hurry, chaps!) ‘Production’ – by now a derisory trickle - ceased in 2002: the scheme was approved in 2006 … and in 2009 it’s all over. Funny business, economics. Happy days ! sorry if i missed something, but is there oil still down there? so - seems to be beyond current technology. But it ain't going anywhere ! It would have made a lovely block of flats somewhere, say between Port Glasgow and Gorbals. Ain't the free market great! It's Friday, 10.06 UK time, and Robert Peston has disappeared from the front page of BBC Business News. No links to his blog or stories at all. Has there been a BBC coup ?